The Great Lakes, along with their connecting waterways and watersheds, make up the largest lake system on the planet—more than 20% of the world’s surface freshwater! Water levels on the lakes change in response to a number of factors, and these changes can happen quickly. Changing water levels can have both positive and negative impacts on shipping, fisheries, tourism, and coastal infrastructure like roads, piers, and wetlands. Currently, water levels on all of the Great Lakes are above their monthly averages, and have been developing since the spring of 2013, when a record-setting two-year rise in water levels began on the upper Great Lakes. 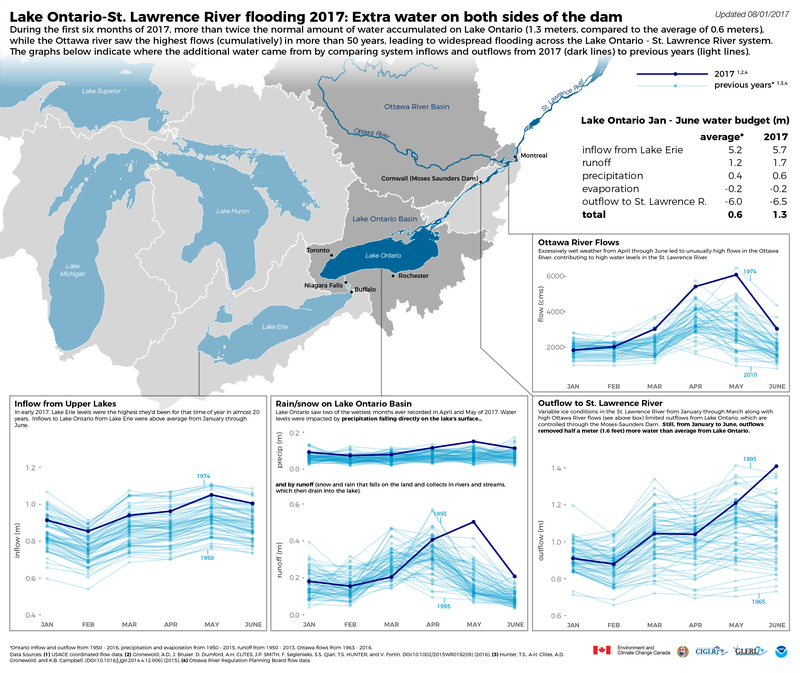 Extreme conditions in spring of 2017 produced flooding and widespread damage at the downstream end of the basin—Lake Ontario and the St. Lawrence River. In case you missed it, check out our infographic on this flooding event. So, what’s happening now that it’s winter? As we entered the late fall-early winter of 2017-2018, a warm weather pattern had forecasters looking toward a fairly warm winter. However, in late December, the conditions changed and a much colder than normal weather pattern took many folks living in the Great Lakes by surprise. Much like how water levels can change quickly in the Great Lakes, so can ice cover. Due to frigid air temperatures, between December 20 and January 7, total ice cover on the lakes jumped 26.3%. Lake Erie alone jumped up to nearly 90%! After January 7th, ice coverage dropped a bit as the air temperatures warmed, then rose again as temperatures went back down, showing again how vulnerable the lakes are to even the slightest changes. Compare where we are now to where we were 2 years ago at this time, and you’ll easily see how variable seasonal ice cover can be in the Great Lakes. What’s the outlook for ice and water levels? Below, you’ll find what GLERL researchers expect to see for ice cover this winter, as well as the U.S. Army Corps’ water levels forecast into Spring 2018. Be sure to read further to find out more about the science that goes into these predictions! On 1/3/2018, NOAA’s Great Lakes Environmental Research Laboratory updated the maximum 2018 Great Lakes basinwide ice cover projection to 60%. The long-term average is 55%. The updated forecast reflects changes in teleconnection patterns (large air masses that determine our regional weather) since early December 2017—movement from a strong to a weak La Nina, a negative to a positive Pacific Decadal Oscillation, and a positive to a negative North Atlantic Oscillation. These patterns combine to create colder than average conditions for the Great Lakes. According to the most recent weekly water level update from the U.S. Army Corps, water levels for all of the Great Lakes continue to be above monthly average levels and above last year’s levels at this time. All of the lakes have declined in the last month. Note that ice developing in the channels and on the lake surface can cause large changes in daily levels during the winter, especially for Lake St. Clair. Over the next month, Lake Superior and Lake Michigan-Huron are expected to continue their seasonal decline. Lake St.Clair, Lake Erie, Lake Ontario are expected to begin their seasonal rise. How are water levels predicted in the Great Lakes? Forecasts of Great Lakes monthly-average water levels are based on computer models, including some from NOAA GLERL, along with more than 150 years of data from past weather and water level conditions. The official 6-month forecast is produced each month through a binational partnership between the U.S. Army Corps of Engineers and Environment and Climate Change Canada. At GLERL, research on water levels in the Great Lakes analyzes all of the components of the Great Lakes water budget. The information we gather is used to improve forecast models. 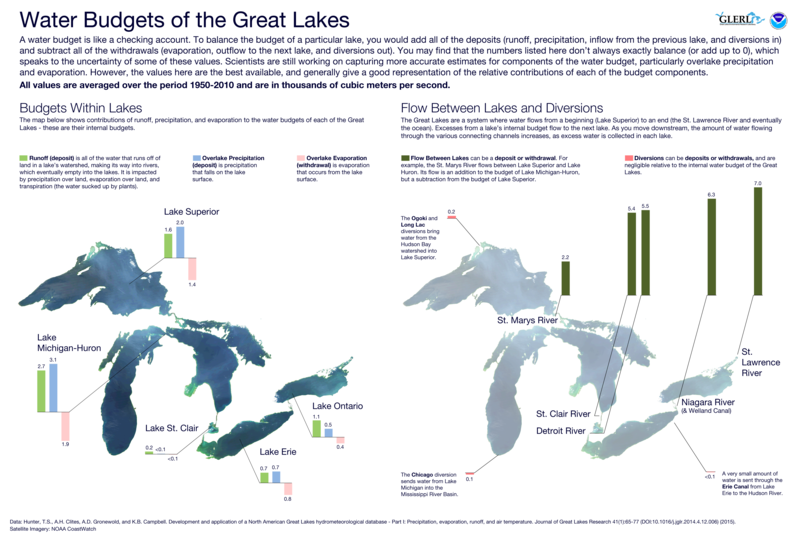 The infographic below goes into more detail about the Great Lakes water budget. How does winter ice cover affect water levels? As mentioned in the recently released Quarterly Climate Impacts and Outlook for the Great Lakes, water levels in the Great Lakes tend to decline in late fall and early winter, mainly due to reduced runoff and streamflow combined with higher over-lake evaporation caused by the temperature difference between air and water. Factors such as surface water temperatures, long stretches of cold or warm air temperatures, and winds all impact the amount of lake ice cover as well as extreme winter events, such as lake-effect snow—which we’ve already seen plenty of this winter—and vice versa. All of these factors influence winter water levels in the Great Lakes. The timing and magnitude of snow melt and spring runoff will be major players in the spring rise. You can find more about GLERL’s water levels research, on this downloadable .pdf of the GLERL fact sheet on Great Lakes Water Levels. View current, historical, and projected water levels on the Great Lakes Water Levels Dashboard at https://www.glerl.noaa.gov/data/dashboard/portal.html. For more on GLERL’s research on ice in the Great Lakes, check out the Great Lakes Ice fact sheet, or check out our website at https://www.glerl.noaa.gov/data/ice/. Want to see a really cool graphic showing the extent of the maximum ice cover on the Great Lakes for each year since 1973? You’ll find that here. Categories: Research | Tags: climate, forecasting, great lakes, Ice, lakes, Modeling, observations, Research, science, snow, water levels, weather, winter | Permalink. The American Meteorological Society’s Annual Meeting (AMS 2017) is upon us and researchers from GLERL and CILER (the Cooperative Institute for Limnology and Ecosystems Research), along with other partners, are hitting the grounds running on Monday with posters and presentations on climate, ice, HABs, modeling, forecasting, transitioning research to ops, and more! Here’s a schedule of where you’ll find us throughout the week. (GLERL and CILER researchers highlighted in italics. Poster titles linked to .pdf of poster, if available.) And, don’t forget to swing by the NOAA booth (#405) to check out all of the fantastic work that NOAA scientists are doing around the world! Abstract: Climate change impacts are a growing concern for researchers and adaptation professionals throughout society. These individuals look to different data sources in order to contemplate the challenges that are present from climate impacts. The use of observational data helps to understand which climatic factors exploit vulnerabilities and to develop solutions to make systems more resilient. However, non-uniform data collection and processing often hinders the progress towards such a goal because many publicly-accessible data sets are not readily usable to address the concern of climate impacts on societies. In the Great Lakes region, there is the added challenge of data quality and coverage issues for over-lake versus over-land observations. The creation of the Great Lakes Adaptation Data Suite (GLADS) aims to resolve these dilemmas by providing processed over-land and over-lake observations within one suite for the Great Lakes region of North America, and this data suite is provided to individuals with a vested interest in decision-making for climate resilience. This intent serves as a way for the GLADS to engage with individuals, from various backgrounds, that are interested in incorporating climate information into their work. Feedback from this audience will be analyzed to further improve the GLADS for use in decision-making. Further analysis will look at the connections among potential users and how they perceive the GLADS as being a useful tool for their research. By gaining perspective into the individuals’ expectations of the tool and their understanding of climate information, the GLADS will be able to accommodate the necessary steps for integrating climate information into decision-making processes to mitigate climate impacts. Abstract: The modeling of waves in shallow environments is challenging because of irregular coastlines and bathymetry, as well as complicated meteorological forcing. In this paper, we aim to provide insight into the physics of storm surge-wave interaction within shallow water regions of the Great Lakes under strong wind events. Extensive hindcast analysis using the 3D-circulation model FVCOM v3.2.2 and the third generation spectral wave model WAVEWATCH III v4.18 was conducted on unstructured meshes for each of the Great Lakes. The circulation and wave models are coupled through a file-transfer method and tested with various coupling intervals. We conducted tests for five short-term (storm length) test cases and three long-term (seasonal) test cases. Time series, spatial plots and statistics are provided. Data exchange of radiation stress, water elevation and ocean currents were tested in both two-way and one-way coupling regimes in order to assess the influence of each variable. Three types of wave current parametrizations will be discussed (surface layer, depth-averaged, and hybrid). The meteorological input forcing fields are 1km/4km/12km WRF model results with time interval of 1h for 4km/12km resolution and 10min for 1km resolution. Statistical analysis was performed in order to evaluate the model sensitivity on the unstructured domain in terms of wind, physics packages and surge-wave coupling effects. These efforts are towards an assessment of the model configuration with a view toward future operational implementation. Abstract: As the next-generation hydrologic and hydrodynamic forecast models are developed, a strong emphasis is placed on model coupling and the expansion to ecological forecasting in coastal regions. 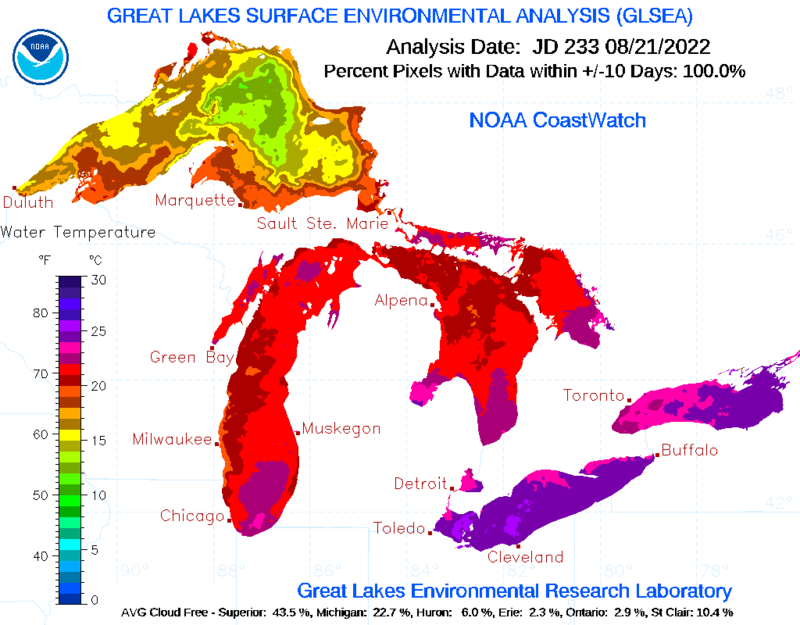 The next-generation NOAA Great Lakes Operational Forecast System (GLOFS) is being developed using the Finite Volume Community Ocean Model (FVCOM) to provide forecast guidance for traditional requirements such as navigation, search and rescue, and spill response, as well as to provide a physical backbone for ecological forecasts of harmful algal blooms, hypoxia, and pathogens. However, to date operational coastal hydrodynamic models have minimal or no linkage to hydrologic inflows and forecast information. As the new National Water Model (NWM) is developed using the Weather Research and Forecasting Hydrologic model (WRF-Hydro) to produce forecast stream flows at nearly 2.7 million locations, important questions arise about model coupling between the NWM and coastal models (e.g. FVCOM), how this linkage will impact forecast guidance in systems such as GLOFS, and how WRF-Hydro stream flows compare to existing products. In this study, we investigate hindcasted WRF-Hydro stream flows for the Great Lakes as compared to existing legacy research models. These hydrological stream flows are then linked with the next-generation FVCOM models, where the impacts to hydrodynamic forecast guidance can be evaluated. This study is a first step in coupling the next-generation NWM with NOAA’s operational coastal hydrodynamic models. Abstract: Understanding how future climate change signals propagate into hydrological response is critical for water supply forecasting and water resources management. To demonstrate how this understanding can be improved at regional scales, we studied the hydrological response of the Laurentian Great Lakes under future climate change scenarios in the 21st century using a conventional regional hydrological modeling system (the Great Lakes Advanced Hydrologic Prediction System, or GL-AHPS) forced by statistically downscaled CMIP5 (Coupled Model Intercomparison Project Phase 5) future projections. The Great Lakes serve as a unique case study because they constitute the largest bodies of fresh surface water on Earth, and because their basin is bisected by the international border between the United States and Canada, a feature that complicates water level and runoff modeling and forecasting. The GL-AHPS framework is specifically designed to address these unique challenges. Existing model validation results indicate that the GL-AHPS model framework provides reasonable simulation of historical seasonal water supplies, but has significant deficiencies on longer time scales. A major component of this study, therefore, includes reformulating key algorithms within the GL-AHPS system (including those governing evapotranspiration), and assessing the benefits of those improvements. Abstract: The extreme North American winter storm of November 2014 triggered a record lake effect snowfall event in southwest New York, which resulted in 14 fatalities, stranded motorists, and caused power outages. While the large-scale atmospheric conditions of the descending polar vortex are believed to be responsible for the significant lake effect snowfall over the region, to-date there has not yet been an assessment of how state-of-the-art numerical models performed in simulating evaporation from Lake Erie, which is tied to the accuracy in forecasting lake effect snow. This study examined the evaporation from Lake Erie during the record lake effect snowfall event, November 17th-20th, 2014, by reconstructing heat fluxes and evaporation rates over Lake Erie using the unstructured grid, Finite-Volume Community Ocean Model (FVCOM). Nine different model runs were conducted using combinations of three different flux algorithms: the Met Flux Algorithm (COARE), a method routinely used at NOAA’s Great Lakes Environmental Research Laboratory (SOLAR), and the Los Alamos Sea Ice Model (CICE); and three different meteorological forcings: the Climate Forecast System version 2 Operational Analysis (CFSv2), Interpolated observations (Interp), and the High Resolution Rapid Refresh (HRRR). A few non-FVCOM model outputs were also included in the evaporation analysis from an atmospheric reanalysis (CFSv2) and the large lake thermodynamic model (LLTM). Model-simulated water temperature and meteorological forcing data (wind direction and air temperature) were validated with buoy data at three locations in Lake Erie. The simulated sensible and latent heat fluxes were validated with the eddy covariance measurements at two offshore sites; Long Point Lighthouse in north central Lake Erie and Toledo water crib intake in western Lake Erie. The evaluation showed a significant increase in heat fluxes over three days, with the peak on the 18th of November. Snow water equivalent data from the National Snow Analyses at the National Operational Hydrologic Remote Sensing Center showed a spike in water content on the 20th of November, two days after the peak heat fluxes. The ensemble runs presented a variation in spatial pattern of evaporation, lake-wide average evaporation, and resulting cooling of the lake. Overall, the evaporation tended to be larger in deep water than shallow water near the shore. The lake-wide average evaporations from CFSv2 and LLTM are significantly smaller than those from FVCOM. The variation among the nine FVCOM runs resulted in the 3D mean water temperature cooling in a range from 3 degrees C to 5 degrees C (6-10 EJ loss in heat content), implication for impacts on preconditioning for the upcoming ice season. Abstract: As the largest group of fresh surface water bodies on earth, the Laurentian Great Lakes have a significant influence on regional climate. Due to the limited spatial resolution of general circulation models (GCMs), the Great Lakes are generally ignored in GCMs. Thus, the technique of dynamical downscaling serves as a practical and important, but challenging solution to the problem of understanding climate impacts and hydrological response in this unique region. Here, we employed the Weather Research and Forecasting model (WRF) with an updated lake scheme to downscale from a GCM with two future greenhouse gas concentration scenarios in the 21st century. Historical validation shows that the WRF-Lake model, with a fine horizontal resolution and a 1-dimensional lake representation, improves the hydroclimatology simulation in terms of seasonal cycles of lake surface temperature, precipitation, and ice coverage. Based on the downscaling results, a hydrologic routing model is performed to project the Great Lakes’ water level changes in 21st century using net basin supply (NBS, calculated as the sum of over-lake precipitation, basin-wide runoff, and lake evaporation) as an input. As the lakes warm and lake ice diminishes, water levels are projected to have persistent and enhanced interannual variations in the presumed climate change. These changes have a range of potential socioeconomic impacts in the Great Lakes region, including changes in hydropower capacity, the length of the commercial shipping season, and the design life of coastal residences and infrastructure. Abstract: Over the past several decades, dramatic changes in the spatial extent of seasonal and long-term ice cover have been documented for both marine and continential (inland) water bodies. Successfully projecting (and planning for) future changes in global ice cover requires an understanding of the drivers behing these historical changes. Here, we explore relationships between continental climate patterns and regional ice cover across the vast surface waters of the Laurentian Great Lakes. The Great Lakes constitute the largest collective surface of freshwater on Earth, and seasonal variability in ice cover is closely linked with lake heat content, energy fluxes, and water levels (all of which have strong linkages with ecological and socioeconomic stability in the region). Our findings indicate that abrupt historical changes in Great Lakes seasonal ice cover are coincident with historical changes in teleconnections, including both the El Nino Southern Oscillation (ENSO) and Pacific Decadal Oscillation (PDO). We find, in particular, that these teleconnections explain much of the ice cover decline in the late 1990s (coincident with the strong 1997-1998 winter El Nino) and the following persistent period of below-average period of ice that followed. We encode these relationships in a probabilistic model that provides seasonal projections of ice cover areal extent across the Great Lakes, as well as specific spatiotemporal patterns in ice cover at resolutions that align with critical regional human health and safety-related management decisions. Abstract: NOAA Great Lakes Operational Forecasting System (GLOFS), developed by the Great Lakes Environmental Research Laboratory and National Ocean Service, has been operational since 2005. A project to upgrade GLOFS, using FVCOM as the core 3-D oceanographic forecast model, has been conducted during the past 3 years involving GLERL, NOS/CSDL and CO-OPS and NCEP Central Operations. The 1st phase of this project has been completed with the operational implementation of a new GLOFS version for Lake Erie on NOAA’s Weather and Climate Operational Supercomputer System in May 2016. Many lessons were learned from transitioning six forecasting systems to operations in 10 years. On the technical aspects which include hardware, software, systems — we found that keys to successful transition are on 1) methods to harden the software infrastructure to make a robust, automated system; 2) backup and alternative procedures for handling missing or corrupted input data; 3) standardized validation and skill assessment metrics; 4) preparation of complete documentation including validation test reports, standard operating procedures (SOP), and software user guides; 5) adequate near-real-time observations of discharge, and water levels to provide LBCs for the system and 6) field projects in the Great Lakes (i.e. IFYGL) to provide surface and subsurface data for the evaluation of the forecast models during development and testing. In particular, program source codes need to be frozen during the testing, validation and the transition period with proper version control. In addition to the technical aspects, a successful system transition from the research/development stage into operations also involves non-technical aspects, such as commitment from senior leadership, frequent communications among all involved parties on progress and milestones, training sessions for the system operators and user engagement workshops for the end users. Abstract: As a unified atmosphere-land hydrological modeling system, the WRF-Hydro (Weather Research and Forecasting model Hydrological modeling extension package) framework is being employed by the NOAA-National Water Center (NWC, Tuscaloosa, AL) to provide streamflow forecasting over the entire CONUS in 250 m resolution from hourly to monthly scale. Currently, efforts are focused on tests and an operational forecast launch on August 16th, 2016. But due to inconsistencies in the land surface hydrographic datasets between U.S. and Canada over the Great Lakes Basin, many of the tributaries feeding the Great Lakes and the major channels connecting the Great Lakes (including the Niagara, St. Clair, and Detroit Rivers) are missing or poorly represented in the current NWC streamflow forecasting domain. Improvements in the model’s current representation of lake physics and stream routing are also critical for WRF-Hydro to adequately simulate the Great Lakes water budget and Great Lakes coastal water levels. To customize WRF-Hydro to the Laurentian Great Lakes Basin using protocols consistent with those used for the current CONUS operational domain, the NOAA-Great Lakes Environmental Research Laboratory has partnered with the National Center for Atmospheric Research (NCAR) and other agencies to develop land surface hydrographic datasets and compatible stream routing grids that connect to the current CONUS operational domain. This research group is also conducting 1-km resolution offline tests with WRF-Hydro based on current best available bi-national land surface geographic datasets to examine the model’s ability to simulate seasonal hydrological response over the Great Lakes (runoff and land-atmosphere fluxes) with its coupled overland flow terrain-routing module, subsurface lateral flow module and channel flow (runoff) module. Abstract: Harmful algal blooms (HAB) plague coastal environments around the world, and particularly in the United States in areas such as the Great Lakes, Florida, Washington, and Maine. In the Great Lakes, shallow embayments such as the western basin of Lake Erie have experienced a period of increasing HAB intensity in recent years, including an event in 2014 where high toxicity levels resulted in a drinking water restriction to nearly 400,000 residents. In order to help decision makers and the public respond to these events, an experimental model has been developed short-term forecasts of HAB concentration and transport. The HAB Tracker uses the next-generation NOAA Lake Erie Operational Forecast System (LEOFS), which is based on the Finite Volume Community Ocean Model (FVCOM). The new FVCOM-based LEOFS model produces hydrodynamic forecast guidance out to 5 days using meteorology from the 3-km HRRR and 2.5 km NDFD. An experimental version of this model also extends the forecast horizon out to 10 days using forecasted meteorology from the GFS. Hourly hydrodynamic conditions (currents, diffusivity, water temperature) are supplied to a three-dimensional Lagrangian particle trajectory model that has been developed to predict HAB transport and vertical migration through the water column. Initial conditions are provided by satellite remote sensing of surface chlorophyll concentration, when available, in which previous nowcasts are used to fill gaps in satellite-derived HAB extent and extend surface concentrations into the water column to produce a three-dimensional field of HAB concentration. In-situ observations of microcystis concentration provide a calibration of particle buoyancy (i.e. colony migration) and a basis for model validation. Results show the three-dimensional HAB Tracker has improved forecast skill out to 10 days over two-dimensional surface concentration forecast products and is better than a persistence forecast out to 5 days. Categories: Communication, Event, Research | Tags: AMS 2017, climate, forecasting, great lakes, lakes, Modeling, Research | Permalink. Ice formation on the Great Lakes is a clear sign of winter! Looking back in time, the lakes were formed over several thousands of years as mile-thick layers of glacial ice advanced and retreated, scouring and sculpting the basin. The shape and drainage patterns of the basin were constantly changing from the ebb and flow of glacial meltwater and the rebound of the underlying land as the massive ice sheets retreated. The amount and duration of ice cover varies widely from year to year. As part of our research, GLERL scientists are observing longterm changes in ice cover as a result of global warming. Studying, monitoring, and predicting ice coverage on the Great Lakes plays an important role in determining climate patterns, lake water levels, water movement patterns, water temperature, and spring algal blooms. Doing research to improve forecasts is important for a variety of reasons. Ice provides us a connection to the past and also serves as a measure of the harshness of current day winter weather. Understanding the major effect of ice on the Great Lakes is very important because ice cover impacts a range of benefits provided by the lakes—from hydropower generation to commercial shipping to the fishing industry. The ability to forecast and predict ice cover is also really important for recreational safety and rescue efforts, as well as for navigation, weather forecasting, adapting to lake level changes, and all sorts of ecosystem research. One great example of the importance of forecasting is illustrated by an incident that occurred in Lake Erie on a warm sunny day in February 2009 when a large ice floe broke away from the shoreline. The floating ice block stranded 134 anglers about 1,000 yards offshore and also resulted in the death of one man who fell into the water. While the ice on the western sections of the lake was nearly 2 feet thick, rising temperatures caused the ice to break up, and southerly wind gusts of 35 mph pushed the ice off shore. Having the ability to forecast how much ice cover there will be, where it may move, and what other factors like temperature, waves, or wind might play a role in what the ice is going to do, is incredibly important to a lot of users. GLERL’s ice climatologist, Jia Wang, along with partners from the Cooperative Institute for Limnology and Ecosystems Research, use two different methods to predict seasonal ice cover for the Great Lakes. One, a statistical regression model, uses mathematical relationships developed from historical observations to predict seasonal ice cover maximum based on the status of several global air masses that influence basin weather. This method forecasts that the maximum ice cover extent over the entire Great Lakes basin, will be 64%. The other forecast method, a 3-dimensional mechanistic model, is based on the laws of physics that govern atmospheric and hydrodynamic (how water moves) processes to predict ice growth in response to forecast weather conditions. This method predicts a maximum ice cover of 44% for the basin this year. As you can see, the two methods have produced different answers. However, if you look at the last chart here, you’ll see that three of the lakes show good agreement between these two model types–Lakes Michigan, Erie, and Ontario. Continued research, along with the historical data we’ve been monitoring and documenting for over 40 years, will help GLERL scientists improve ice forecasts and, ultimately, improve our ability to adapt and remain resilient through change. Below, is the most recent Great Lakes Surface Environmental Analysis (GLSEA) analysis of the Great Lakes Total Ice Cover. GLSEA is a digital map of the Great Lakes surface water temperature (see color bar on left) and ice cover (see grayscale bar on right), which is produced daily at GLERL by Great Lakes CoastWatch. It combines lake surface temperatures that are developed from satellite images and ice cover information provided by the National Ice Center (NIC). This image is the analysis of January 10, 2017 (13%). For the most current analysis, visit https://coastwatch.glerl.noaa.gov/glsea/cur/glsea_cur.png. For technical information on GLERL’s ice forecasting program, check out our website here. You can also find much of the information in this post, and more, on this downloadable .pdf of the GLERL fact sheet on Great Lakes ice cover. 94.7% ice coverage in 1979 is the maximum on record. 9.5% ice coverage in 2002 is the lowest on record. 11.5% ice coverage in 1998, a strong El Niño year. The extreme ice cover in 2014 (92.5%) and 2015 (88.8%) were the first consecutive high ice cover years since the late 1970’s. On March 6, 2014, Great Lakes ice cover was 92.5%, putting winter 2014 into 2nd place in the record books for maximum ice cover. Satellite photo credit: NOAA Great Lakes CoastWatch and NASA. Categories: Communication, Education, Research | Tags: climate, Climate Change, great lakes, Ice, Modeling, Research, winter | Permalink. The new two-way coupled model is driven by heat budget estimates (how much energy enters the system); that affects the water budget and how much energy is exchanged between a lake and the atmosphere along with large lake processes that are dynamic and seasonally variable. The Great Lakes are more like inland seas. From the cold depths of Lake Superior fisheries to the shallow algae blooms of Lake Erie, the bodies of water differ greatly from one another. Yet they are all part of one climate system. Up until now, atmospheric models and hydrodynamic models have remained separate to a large extent in the region, with only a few attempts to loosely couple them. In a new study, published this week in the Journal of Climate, an integrated model brings together climate and water models. The collaborative work brought together researchers from Michigan Technological University, Loyola Marymount University, LimnoTech as well as GLERL scientist, Philip Chu. Pengfei Xue, an assistant professor of civil and environmental engineering at Michigan Tech, led the study through his work at the Great Lakes Research Center on campus. To help understand climate change and other environmental issues, Xue and his team connected the dots between the air and water of the Great Lakes. The new model will be useful for climate predictions, habitat modeling for invasive species, oil spill mitigation and other environmental research. Categories: Communication, Publications, Research | Tags: 3-D Modeling, climate, Climate Change, Coupled Modeling, great lakes, lakes, Modeling, Research | Permalink. In a new study, scientists from GLERL, the University of Michigan, and other institutions take a new look at changing ice cover and surface water temperature in the Great Lakes. The paper, set to be published in Climatic Change, is novel in two ways. While previous research focused on changes in ice cover and temperature for each lake as a whole, this study reveals how different regions of the lakes are changing at different rates. While many scientists agree that, over the long term, climate change will reduce ice cover in the Great Lakes, this paper shows that changes in ice cover since the 1970s may have been dominated by an abrupt decline in the late 1990s (coinciding with the strong 1997-1998 winter El Niño), rather than gradually declining over the whole period. NOAA tracks ice cover and water surface temperature of the Great Lakes at a pretty fine spatial scale. Visit our CoastWatch site and you’ll see detailed maps of surface temperature and/or ice cover updated daily. However, when studying long-term changes in temperature and ice cover on the lakes, the scientific community has used, in the past, either lakewide average temperature data or data from just a few buoys. We knew how each lake was changing overall, but not much more. Now, for the first time, researchers are using our detailed data to look at the changes happening in different parts of each lake. Using GIS (geographic information system) analysis tools, researchers calculated how fast ice cover and temperature were changing on average for each of thousands of small, square areas of the lakes (1.3 km2 for ice cover, and 1.8 km2 for temperature). The maps below show the results. Changes in ice, on the left, are reported in the number of days of ice cover lost each year. Temperature changes are reported in degrees Celsius gained per year. Panel a shows the change in seasonal ice cover duration (d/yr) from 1973 to 2013, and panel b shows the change in summer surface water temperature (°C/yr) from 1994 to 2013. Maps from Mason, L.A., Riseng, C.M., Gronewold, A.D. et al. Climatic Change (2016). doi:10.1007/s10584-016-1721-2. Click image to enlarge. The researchers also averaged these values across major subbasins of the lakes. Maps of those results are below. The color coding is the same, and again, ice cover is on the left while temperature is on the right. Note: These subbasins aren’t random, and were outlined by scientists as a part of the Great Lakes Aquatic Habitat Framework (GLAHF), which is meeting a need (among other things) for lake study at intermediate spatial scales. The panel on the left shows the change in seasonal ice cover duration (d/yr) from 1973 to 2013, and the panel on the right shows the change in summer surface water temperature (°C/yr) from 1994 to 2013. Maps created by Kaye LaFond for NOAA GLERL. Click image to enlarge. Depth, prevailing winds, and currents all play a role in why some parts of the lakes are warming faster than others. A lot of information is lost if each lake is treated as a homogenous unit. With so much variation, it may not make sense for every region of the Great Lakes to use lakewide averages. Studying changes at a smaller scale could yield more useful information for local and regional decision makers. The second part of the story has to do with how ice cover has changed in the lakes. Previous studies typically represent changes in ice cover as a long, slow decline from 1973 until today (that would be called a ‘linear trend’). However, when looking at the data more carefully, it seems the differences between the 70’s and today in many regions of the Great Lakes are better explained by a sudden jump (called a ‘change point’). The figure below shows yearly data on ice cover for the central Lake Superior basin. It is overlaid with a linear trendline (the long, slow decline approach) as well as two flat lines, which represent the averages of the data before and after a certain point, the ‘change point’. Annual ice cover duration (d/yr) for the central Lake Superior basin, overlaid on the left with a linear trend-line, and overlaid on the right with a change-point analysis. Graphic created by Kaye LaFond for NOAA GLERL. Click image to enlarge. Statistical analyses show that the change point approach is much better fit for most subbasins of the Great Lakes. So what caused this sudden jump? Scientists aren’t sure, but the change points of the northernmost basins line up with the year 1998, which was a year with a very strong winter El Niño. This implies that changes in ice cover are due, at least in part, to the cyclical influence of the El Niño Southern Oscillation (ENSO). All of this by no means implies that climate change didn’t have a hand in the overall decline, or that when there is a cyclical shift back upwards (this may have already happened in 2014) that pre-1998 ice cover conditions will be restored. The scientific consensus is that climate change is happening, and that it isn’t good for ice cover. This research just asserts that within the larger and longer-term context of climate change, we need to recognize the smaller and shorter-term cycles that are likely to occur. Categories: Communication, Research | Tags: climate, Climate Change, GIS, great lakes, Ice, Modeling, Planning, Spatial Analysis, temperature, Warming | Permalink. The Quarterly Climate Impacts and Outlook for the Great Lakes Region is out! The Great Lakes Region Quarterly Climate Impacts and Outlook June 2016 was published today. As you may have noticed, this spring was fairly mild temperature-wise and mostly uneventful in terms of severe weather. After a couple of late cold spells and above-average precipitation in early spring, May brought a few record-breaking temperatures within the region and lower than average rainfall. . Despite the late-season dry conditions, lake levels are at or above average throughout the entire region as we enter summer and warmer than average temperatures are predicted from July through September. To read more on the past season’s outcomes, as well as the forecast for summer, download the complete report below. NOAA and its partners around the Great Lakes region work together to produce the Quarterly Climate Index and Outlook to inform the public about recent climate impacts within their respective regions. This regional climate outlook discusses the major climate events during the past three months and contains historical seasonal assessments as well as future climate outlooks. To receive this outlook via email, visit: https://illinois.edu/gm/subscribe/17196. Categories: Uncategorized | Tags: climate, great lakes, lake levels, temperature, weather | Permalink.